This week's invasive weed was useful in the past and has an interesting history. Teasel (Dipsacus fullonum) is a European native weed that has been around human civilization for centuries. We've found a number of uses for this spiny, coarse plant over the years and it also has some interesting folklore associated with it. In ancient Ireland, teasel was used as a first layer for thatched roofs. The spines on the stems helped hold the other materials in place. They also made some very ferocious looking brooms for sweeping the bad spirits from the home and teasel hung above the doorway prevented witches from entering. Apparently the ferocious spines was enough to deter the bad spirits that might enter the home. 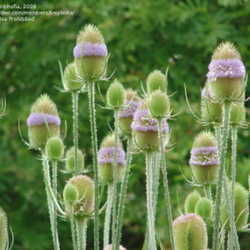 Teasel was the companion plant to the Nordic and Germanic domestic goddess Hulda/Holda. She was in charge of the household and was especially important to spinning and textiles. The dried seed heads were used to comb the nap of woven wool cloth smooth, 'teasing' the knots from the surface. During the 19th Century, the seed heads were actually used in the commercial fabric industry to raise the nap on woven fabrics, since the natural comb would break instead of tearing the cloth like a metal one would. Traditional weavers still prefer teasel to modern combs even today. They often keep a teasel patch to have the seed heads handy when they need them. This European native was introduced into North America and other areas during the 1800's. As fabric production grew in the New World and beyond, the plant soon escaped cultivation and made itself right at home wherever it landed. The seed heads easily clung to the fur of bears and wolves, while many small birds such as goldfinches found the seeds appealing and did their part to spread the teasel far and wide across the world. Here in North America, it is often seen growing along the right of ways in highways and in fallow fields. 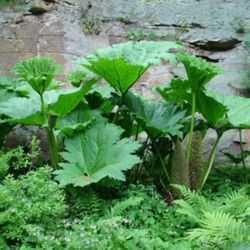 It is now listed as a noxious weed in a number of states, Canadian provinces and Australia. The plant forms vast colonies that choke out other forms of vegetation and the seeds remain viable in the ground for a number of years. Ask me how I know this. I thought it would be cool to have such an unusual plant in my garden and that was nearly a decade ago. I still get seedlings sprouting every spring that I have to remove. 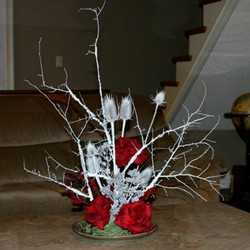 The spiny stems are quite vicious even long after the plant has died and can cut arms and legs on unsuspecting hikers. To completely eradicate teasel as a nuisance, the problem area must be worked long and often. 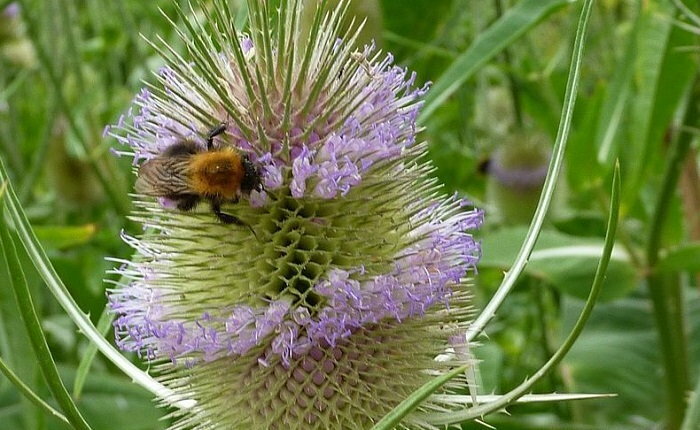 To remove teasels from an area, cut the plants back as they flower. If done before the flowers appear, this just encourages them to send up reinforcements. However, teasel flowers do produce lovely honey and bees seem to find the flowers very attractive. There have been a number of folk remedies associated with teasel and they range from the believable to the bizarre. It was believed that if you cut open a teasel head and there was a worm inside (apparently there almost always was) that the worm worn around the neck would charm sickness away. This was especially true for malaria and it was even given the nickname 'malaria plant' in some cultures. However, modern medicine is taking a hard look at the teasel plant. It seems that compounds in the roots are effective in treating lyme disease. More research is necessary to determine the dosage and effectiveness, but the initial experiments seem promising. The clasping leaves that form shallow bowls around the stems of the plant hold water and this water was supposed to be a cure-all for everything from sore eyes to freckles. The plant has no toxic compounds that could harm the eyes, and was often used as an eyewash even though the desired cure didn't always manifest itself. Interestingly enough, the water that pools in these leaf axils tends to trap insects and the plant makes use of the free compost in a kind of semi-carnivorous way. Plants with decomposing insects in the water, tend to produce more seeds. More seeds means more teasel plants and each seed head can easily produce over 100, so that is problematic. Teasel heads are often used by florists in their arrangements and I even wrote an article several years ago on how to use them in making an arrangement for the winter table. It is a unique and interesting plant that if managed properly, makes a bold statement in the garden, but gardeners should be aware that it can spread aggressively and become a thorny nuisance. If you want to use the seed heads, find a patch of it growing elsewhere. The property owner will no doubt be delighted to let you take some.